Playing with baby dolls benefits little boys and girls in all areas of development. Having a favorite baby to play with not only improves their social skills, through imaginative play, and strengthens their values of compassion and selflessness, but it gives them a ‘friend’ to always have by their side. Famous for their collection of babies for kids from birth+, Corolle excels at supporting their line with quite a few fun accessories that allows kids to take their playtime to the next level. 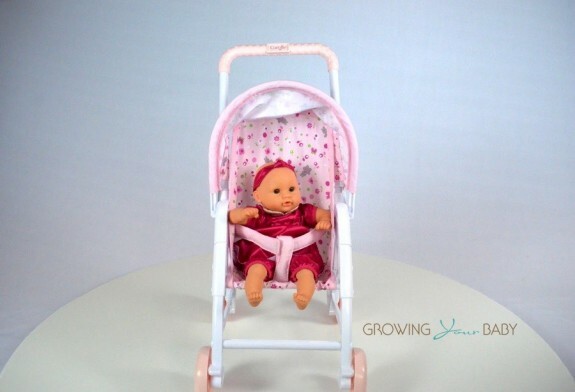 Corolle’s Mon Premier Calin Doll Collection is perfect for toddlers 18 months+ because the babies are only 12″, which makes them the perfect size to be carried around by little hands. 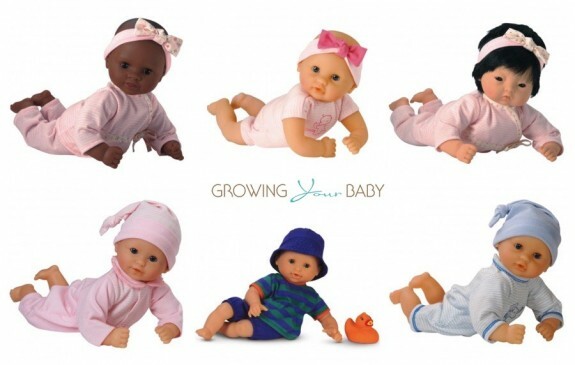 We love that the collection includes dolls of all ethnicities, and also baby boys. Kids can chose from babies that are in their sleepers, dressed for a party or ready for the bath! For 2014 Corolle introduced their Party in Paris line, which added some style and glitz to their collection. 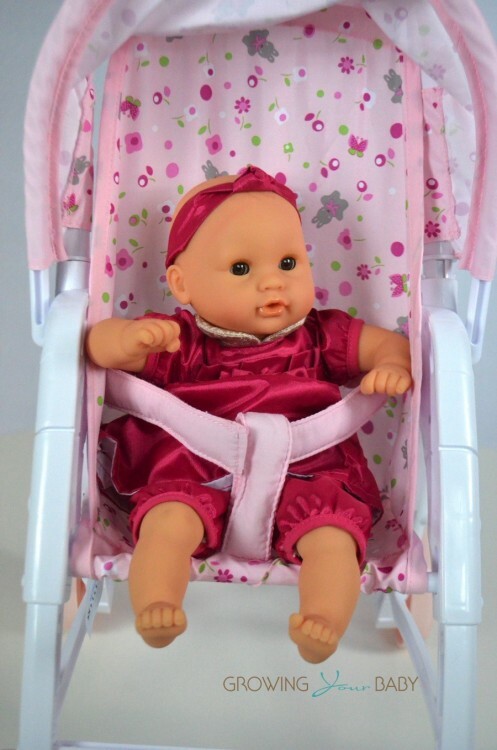 Our Mon Premier Calin doll came dressed in a gorgeous pink tafeta dress, with a gold collar and matching headband. Just like the other Calin dolls she has a cuddly bean bag body, soft vynil skin, eyes that sleep when she is reclined and is scented with vanilla. To help kids take care of their babies, Corolle offers beds, strollers, and feeding accessories. Because little ones can’t leave home without their baby, the Mon Premier Diaper Backpack is the perfect way to keep them close. Designed to fit a 12″ doll in built-in baby carrier on the front, this roomy diaper bag is also a great way to carry all of their doll’s essentials. The backpack just velcros on with two straps in the front and opens up to reveal a change pad for baby and two pockets inside for extras. The cute pink print has Corolle’s name on it, and some sparkly stars. We love that having baby clipped to the back of the pack allows your child to walk hands-free when you are out, while giving them the piece of mind that their baby is close. The most popular piece of gear for dolls, the Mon Premier Stroller ensures that baby goes where you go – comfortably. This stroller snaps together easily, comes with a 3-point harness to keep baby in place and a small canopy for sunny days. Because it only fits 12″ dolls, it is a smaller stroller that is only appropriate for toddlers to 3/4 depending on their size. Bonus for boys – it also comes in blue! When it’s bedtime, the Mon Premier Cradle is the perfect place for baby to sleep. Measuring just under 15″ long, this bed is both cozy and space-efficient. It comes with a mattress that is split for baby’s head and body, and a matching pink blanket. Kids will like that it rocks like a classic cradle for sleepy time and has a sweet bunny print . We have put together a video to better feature the collection! Kourtney Kardashian and Scott Disick Welcome Third Child – A Boy!